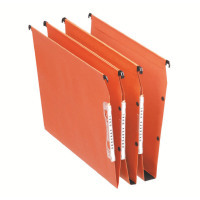 This pack of 25 Orgarex Lateral Files is the ideal choice for bright and durable everyday filing. These files feature a clever linking system for better organisation and operation - just link the hooks and press buttons together. Magnifying label holders allow for quick identification of each file. They're constructed of extra-tough 220 gsm manila card for robust durability in everyday use and feature a 30mm capacity for up to 300 sheets.